Cincinnati/Crestview Hills, February, 10, 2016, Siôn Williams, Director of Business Development for FUSIONWRX (an activation and engagement agency) has been selected as one of only 56 entrants into the C-Change Class 11, sponsored by the Cincinnati USA Regional Chamber. C-Change is the premier leadership program in Cincinnati and is entering its second decade of developing the region’s young talent. Williams will join representatives from paramount companies in our community such as Procter & Gamble, Fifth Third Bank, Metro, WCPO and Great American Insurance. “We are honored to have Siôn, as a representative of FUSIONWRX and Flottman, selected to this very elite group of individuals, I am certain that Siôn’s global experiences will add tremendously to the opportunities presented within C-Change.” – Tom Flottman, President of Flottman Company. Siôn Williams is originally from Wales. 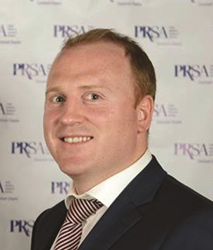 He spent his early career working in sports marketing roles with a leading rugby club in London, England, followed by the British Colligate Sport Governing Body. Williams moved to Cincinnati after a 3 year stint in Los Angeles, where he co-founded a national rugby organization. Williams played professional rugby for two years in Europe and the United States. Currently, Williams is charged with growing a new marketing activation agency entitled FUSIONWRX. Williams’ passions include sports, coaching, travel, his wife and two young children.